The Parish Church of Mülln is on the most northern extension of the Mönchsberg mountain. "Mühle" means "mill" in German and this is what "Mülln" is derived from - the "church by the mills" was mentioned in documents for the first time in 1148. 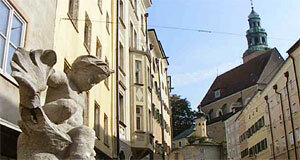 Today′s church, designed by the builders Ulrich Dankl and Heinrich Murauer, was opened in 1453. Prince Archbishop Wolf Dietrich von Raitenau gave it to the Augustine hermits that moved into their new abbey, the Augustinerkloster next doors, in 1605. The western façade was covered with a long staircase and an entrance hall between 1605 and 1609. The famous and easily recognised bell tower was built in 1674. The arch between church and abbey was built in 1614. The church itself consists of one nave that was originally covered by a late-Gothic fan vaulted ceiling; this ceiling was re-modelled in the early 17th century with rich stucco-decorations. In a most successful attempt to "Baroqueinise" the Müllner Pfarrkirche, the church gained its current, rich interiors around 1735. The main altar from 1758 is a combination of Gothic, Baroque and Rococo. The altar itself in red marble holds a tabernacle in Rococo style from 1760, but also a late-Gothic Madonna from 1450 and angle statues in Baroque style that frame the Virgin. One of the side-chapels holds an altar painting by Johann Michael Rottmayer from 1690. It shows St. Nicolaus of Tolention having a vision of Jesus Christ as a child. Note the nearby Leprosenhaus, the beer garden of the Müllner Bräu and the Bärengässchen Lane.